With so many of us planning (note the word “planning”) to be good and cut back on sugar, hit the gym, go for a walk at lunch every day, take up a new hobby or play a new sport – resolutions are on the brain. But do they really work? Well for most of us, they probably won’t. But don’t worry folks – it’s not you – it’s science! Here’s why we generally fail miserably at our New Year oaths. Do you actually want to cut out coffee or start going for more jogs around the block? Maybe you’ve heard someone else is doing the same and so you’ve said, ‘Why not?’ The problem is if you’re not feeling it in your own gut and soul, starting fresh into badminton every Wednesday isn’t going to happen. Stay true to how you can make YOUR life better. Everyone’s goals are different. Getting fit and implementing a healthy diet within two months might be realistic for someone who has that bit more time on their hands. People who have little intervals throughout the day often find the best yoga classes, the best way to start a new initiative on a budget or more time relax and take it all in. If it takes you 12 months to really incorporate something into your routine – that’s still progress! We always hear people saying, ‘After I do this, I’ll have the motivation to do that.’ Is motivation what we think it is? It’s likely the case we’re really just procrastinating because we know we’re about to do something we really don’t want to! Sorry folks, there’s no time for waiting about – dive right in NOW! They call it a New Year’s resolution. Doesn’t that make you cringe?! It has so many horrid connotations attached to it that hit on torture, deprivation, and tears. By all means, we need goals in life, but maybe just not New Year’s resolutions. We’re in the midst of winter and so many of us are feeling as though we should cut down on carbs, cut out the extra hot chocolates or the warm coffees. Are they having a laugh?! We’d only freeze. It’s only right we have a little more energy intake during the cool season. 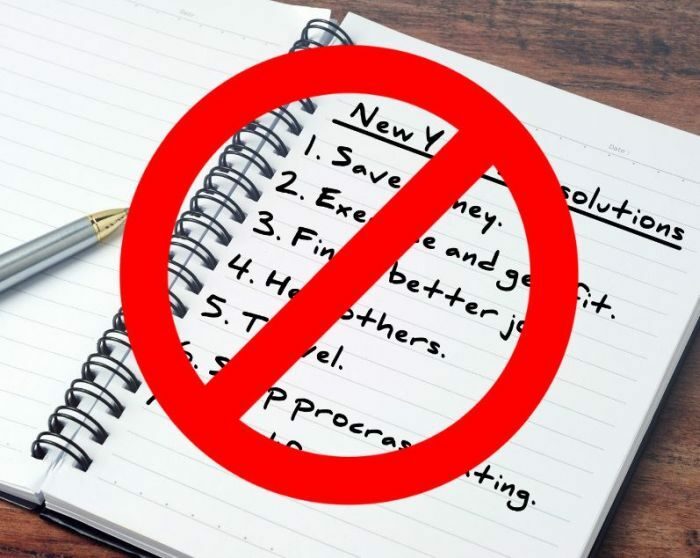 Often our resolutions are very broad and large – hence why they fall by the wayside along with our self-will. When we tell ourselves ‘I’m going to eat better’ or ‘I’m going to exercise more,’ we’re usually not helping ourselves. If we aim to get in 2 kinds of extra greens a day, or go for 2 runs a week instead of 5, we’re much more likely to succeed! If we’re trying out something new, like hitting the gym every second day, there’s not much point in picking up the heaviest weights once you’re in the door. Whatever you’re trying to make a regular habit, ensure it’s not too hard in the beginning. If you have little achievements here and there, you’re much more likely to keep up the good work. Baba make I tell you something, las las everything na major scam, na wetin some people do for 2018 them go still do for 2019. Do You Enjoy This List?